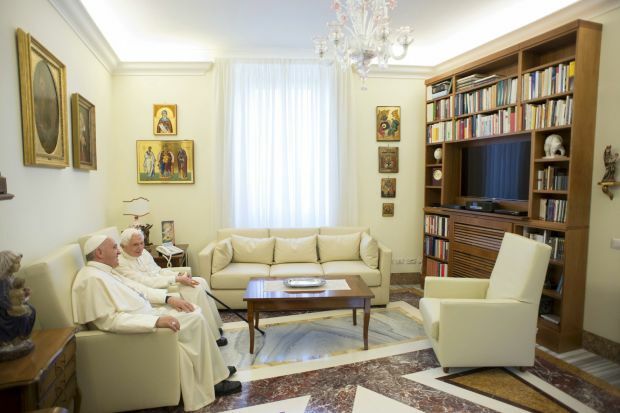 VATICAN CITY (CNS) — Pope Francis visited retired Pope Benedict XVI at his Vatican residence June 30 to wish him a happy summer. The 88-year-old retired pope is expected to remain at the summer villa just two weeks, until July 14. Before he resigned, Pope Benedict, like many of his predecessors since the early 1600s, spent a large portion of the summer months at the 135-acre papal villa to escape Rome’s oppressive heat. Pope Francis, however, who — even as archbishop of Buenos Aires — is not known to take a full vacation, lightened his schedule just a bit for July. He will still hold his Angelus prayer and address every Sunday; however, there will be no Wednesday general audience for all of July, said Jesuit Father Federico Lombardi, Vatican spokesman. The general audience will resume in August in the Vatican’s solar-powered and air-conditioned Paul VI hall. For the month of July, all audiences with the pope are expected to be suspended — except a meeting with members of the Catholic charismatic renewal movement in St. Peter’s Square July 3.